Further details have been revealed for a new multimillion pound school in Rotherham. 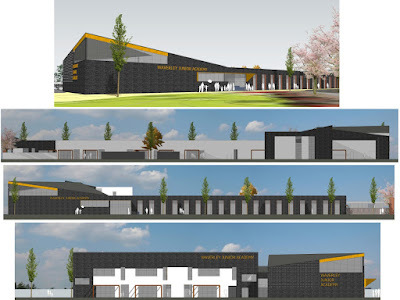 In July, Rothbiz revealed the initial designs for what is being called "Waverley Junior Academy", the new school proposed for the Waverley development in Rotherham. Now a planning application has been submitted from Rotherham Council, detailing how the new school will look. Set to be built on land at Highfield Lane and Waverley Walk, the 31,000 sq ft building will be constructed mainly on a single ground floor level apart from the Highfield Lane Teaching Block which will be two storey to accommodate six class bases on each floor, with ancillary toilets and storage. A main hall and a stand-alone ASC (Autistic Spectrum Condition) building are also proposed, along with a grass area large enough to accommodate a range of formal recreational sporting activities and a perimeter route to enable pupils to undertake their "Daily Mile" - a popular, simple and free initiative that sees children run or jog for 15 minutes every day in their primary and nursery schools. Space for potential expansion is included and eventually the school will be capable of accommodating approximately 500 pupils; with the possibility of expansion should it be deemed necessary in future. The plans show space for nursery, reception, infant and junior school pupils. Landscape plans are also included showing a wildlife area, traditional playground and outdoor classrooms. Fronting Waverley Walk, the school building "takes on the appearance of a colonnade with slender columns and glazing giving a civic presence for the building, which is to be seen as a community building," according to the plans. There are no student drop off / parking proposed within the site, but there is to be a drop of bay area along the street that is currently unnamed, on the Eastern side of the site. Only the second new school built in Rotherham in the last 25 years, the school will form a central part of the new Waverley community, which is fast taking shape on the site of the former Orgreave Colliery. In order to meet the projected intake, the school needs to be sited and fully operational before September 2020, when the new term begins. Don't know why Rotherham just dosnt let Sheffield administrator this whole area,let them.have costs of school,might as well as all residents in that area always associate themselves as Sheffield,don't like to be called Rotherham.Non loss! Having lived in Sheffield and Rotherham I know which local authority I would rather Waverley fall under, and it isn't Sheffield. As for the school; a great addition to the growing community. Let's just don't hope it gets swamped with people from outside the catchment area. I also live on Waverley and get cross when it is referred to as Sheffield. Sheffield only want bragging rights to the AMP. We are Waverley, Rotherham and that's that. I completely agree! I live at Waverley and hate it being classed as Rotherham...the sooner it’s classed as Sheffield the better.